Welcome to the Kingsbridge Heights Community Garden! We are 1,000 square feet of vegetable, fruit, and herb-growing goodness. Here at the Kingsbridge Heights Community Center, we believe that fresh, nutritious, organic food is a right, not a privilege. To empower this mentality, we use our community garden to educate, encourage, and inspire the community we serve through our Nutrition and Food Access Program. Weekly nutrition classes, teen and family chef battles, and community events like our Harvest Festival help us reach that goal. This green space provides our community with the ability to escape the demands of city life into a world that is filled with vibrant colors, tastes, and smells. We always welcome volunteers, corporate groups, tours, and inquiries. We have seasonal garden social and volunteer events, where we meet with our community to share the fruits of our labor and the great work that our dedicated staff does in our community. Food Pantry that distributes up to 2,700 pounds of donated food annually to low-income families and children who attend our programs. SNAP Enrollment Service to help families in the Kingsbridge Heights Community enroll in the Supplemental Nutrition Assistance Program (SNAP). Feeding Program where approximately 400 low-income children and youth receive freshly prepared, healthy meals in our early childhood and afterschool programs on a daily basis. Garden tours take place between May and October, led by one of our dynamic and knowledgeable staff. Garden workshops allow our visitors to get their hands into the soil and realize the fruits of their labor. We offer hour-long garden workshops tailored to your needs. Individuals, schools, and other organizations are welcome to work as a team or with our kids to plant seeds, hunt for veggies, learn about composting, and see the seed to plate process. 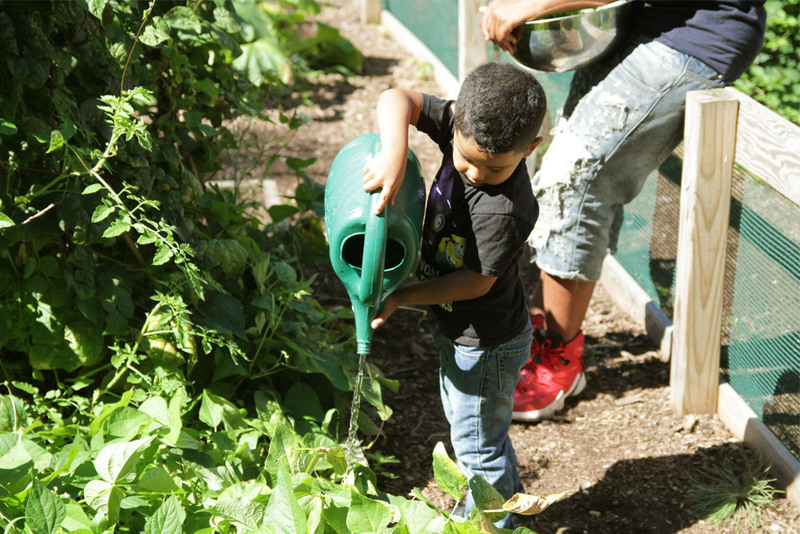 Growing Futures Summer Youth Internship where interns learn about and experience the food systems process by growing, maintaining and harvesting produce from five community gardens in the Northwest Bronx. Participants develop skills such as problem solving, teamwork and time management, while also providing in-depth knowledge of food security, sustainability, horticulture, and community development. Careers in horticulture and the food-tech industry are explored, and the experience enhances participants' resumes and/or college applications.